A new Cisco Adaptive Security Appliance (ASA) automatically enters initial setup when it boots for the first time or if you erase the configuration. If your ASA does not enter setup mode, you can set up from Privileged EXEC mode. The following code shows the basic setup process, with responses you need to add in bold. Within just a few minutes, you can have your ASA up and running. WARNING: http server is not yet enabled to allow ASDM access. Notice how little information you need to enter to get basic management access to your ASA over the network (well, almost). The setup process has set up the internal IP address and configured an Access Control List (ACL) entry to allow only the IP address of the computer that ran the setup to manage the ASA from one host on your network, but it has not actually enabled access. From this point, you can connect your ASA to a switch and manage it from a device with the IP address you specified in the initial set up of the device. The ASA 5505 places all switch ports into VLAN 1 (your Inside VLAN) by default, whereas the large ASA devices have a dedicated management interface or port. The management function can be configured to operate over the other interfaces on the ASA. After you have the management interface up for the Cisco Adaptive Security Device Manager (ASDM), you can run the Startup Wizard through the ASDM (even if you already set up the ASA on the command line). The benefit to running the Startup Wizard is that you can go to the computer you identified as your management computer and point your web browser to the interface address of your ASA. (Note: You need to have Java installed on this computer.) 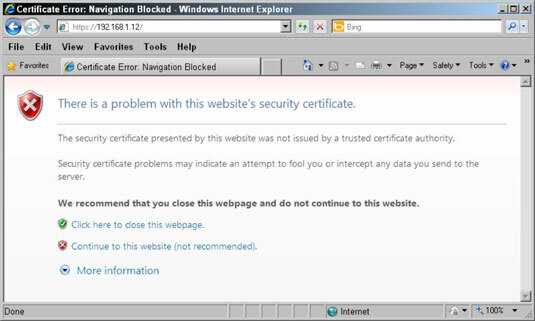 Unless you install a valid certificate that matches the name of the ASA, you are presented with a certificate error.